Philips decided to diverge from usual style and produced a clamshell phone, targeted to youth market, mainly to middle price segment. There is rather a high demand in this price band and the company will try to satisfy it due to Philips 330. The main peculiarity of this phone is that it has only a series number, without word Fisio, which was used before. 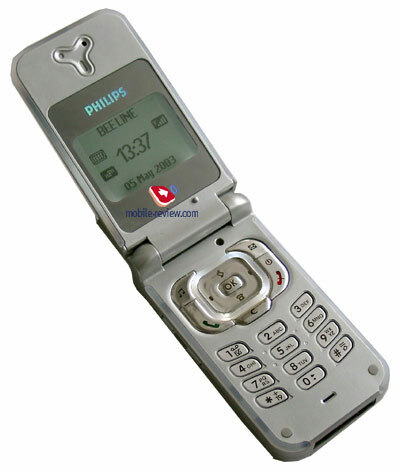 Today Philips 330 is one of the cheapest clamshell phone from the European manufacturer. Let’s take up its weaknesses and strengthens. The handset has glossy cover plates, which are located on the rear and front parts of the phone. In our opinion this model is made in hi-tech style. Phone’s sides are silver. This handset is produced in several colors, i.e. they have different colors of cover plates (they can’t be removed). Phones of red, dark blue and silver colour will be available in Russia. Sometimes finger-prints are left on the glossy covers of the phone and one should clean the handset. It is the shortcoming of all the handsets, which are produced of such materials. A loudspeaker is positioned on the front cover, a service indicator – company’s identity, is located on the upper part of the handset. It is blinked by different colors while incoming call. By the way, there is one more service indicator, which is placed along the phone’s side, it is blinked by white while incoming call. It is a peculiar feature of this model, there are no other models, which have the same function. So, you can easily stand out with the handset against the background of others. There is a strap hole on the topside of the phone. A system connector is positioned on the bottom. A double volume key is placed on the left-hand side. The phone looks very attractive, one can hardly relate it to a middle price segment. But when you open the phone, you will be disappointed. Combination of silver plastic and glossy keys does not look so nice as the phone’s exterior. Keys are small and placed deeply in the phone, you touch the case while pressing them and it’s not very convenient. Keys have a white backlighting, characters are almost not seen on the digital keys, as the light is too dim. 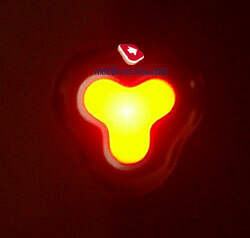 On the contrast, a navigation key is rounded up by the lighting rim, which is very bright. All keys are made of plastic. Besides, there is a mirror rim around the screen. It is one more designer’s solution. Unfortunately, finger-prints are remained there too and you should clean the screen after each talk. Philips 330 is equipped with a graphical display, which has a white backlighting comparable to one, which was used in Philips Fisio 625. Up to 6 lines (4 text lines and 2 service lines in SMS mode) are contained on the display. Fonts are quite visible; characters’ size fits the screen’s size. When the phone is active, a backlighting around the screen is also activated. It looks very unusual. A lithium-ion battery of 600 mAh capacity is applied in the phone. According to a manufacturer, the phone has up to 400 hours of standby time and up to 4.5 hours of talk time. In reality (Beeline network) the handset could operate about 3 days in case of 30 minutes of talking and minimal using of other functions. Time of full re-charging is about 2 hours. It is necessary to add the handset has compact dimensions and lightweight. It allows to wear it everywhere, in the inside pockets or jeans. An external aerial is not a problem. The main menu structure is a carousel based. This principal has been used since models from Philips had been equipped with a Jog Dial. There are no Pilot keys in the new models, but menu structure remained the same. It is not very convenient in this model, as it is necessary very often to press a navigation key, which is not comfortable, because it is located too deep in the case. Just press OK key to enter a menu, C key or upper arrow of the navigation key to exit the top level. If to try leaving with the help of release key as in phones of all other manufacturers, it will turn out nothing. Reject key is used only to reject calls in this phone. Up to 8 keys can be assigned to quick commands or speed dialing of phone numbers. Partially it corrects shortcomings of the menu structure (too many different submenus), as the most frequently used features can be added to the keys. There is an opportunity to keep up to 40 voice labels, they can be used for access to most frequently used menu items or phone numbers as well. A quick overview of the menu and its functions resemble some other phone, namely Philips Fisio 625. The main differences are absence of voice memo function and GPRS supports. Other features are almost the same. For example, in Philips 330 you can immediately save received SMS-messages in the phone memory. In the total list there is a search by the first letter of name. Repeated pressing does not result in anything, it is necessary to thumb through the list even for one name to enable again the fast search by the first letter. It explains the fact that it is possible to search for name by all letters, i.e. for example for surname Ivanov we press 4 (ghI)-8 (tuV)-2 (Abc). Messages. Messages, here read the accepted messages and create the new ones. When viewing the list of messages, each chosen message is automatically completely displayed (running line), and when opening the separate message it is also automatically scrolled, but already in full screen mode. It is rather interesting and curious. There are 10 templates in English. With the message it is also possible to send one of many icons or simple melody (EMS). E-mail. The built-in post client, understands usual mail boxes (up to 2), works as with POP3, and SMTP. It doesn’t support attachments (except jpg). Messages that in the size are more than 7 KB are not accepted. Call list. There is a mixed call list in the phone, i.e. in it locate both missed, and received or typed numbers. Date and time can be viewed for everyone, if it is necessary. In the list can be up to 30 records, it is called from standby mode by moving joystick upwards. Numbers from the list can be used precisely the same as from the phonebook (messages, details viewing, etc.). Organizer. As well as follows from the name, the organizer disappears here. There is an opportunity to see calendar for month, week. When viewing calendar for month are marked all the days for which there are events, and in week view there is a breakdown on days and opposite each day the event icon is displayed. There are events of three types: meeting, rest and business. For each record is entered the date started and the date closed, events can be repeating (day, week, month, year). Also is adjusted the warning for event. There is just one trouble, events at operation demand confirmation, it sometimes irritates. There is an opportunity to remove old events. As a whole the organizer is comprehensible, but no more that. Organizer and phonebook memory is allocated dynamically. A surprise - 300 records in the last one, are possible only in case if there is organizer records in general. The general number of records for phonebook and organizer is limited - 300. Call counters. Here are collected every possible call counters. All adjustments of call are hidden here, it can be one of 30 melodies (+ 1 received, melodies from Motorola and Alcatel are suitable), vibration alert, the mixed mode. Quick Settings. Various profiles locate here, there are “Meeting”, "Silent", "Personal", etc. The problem consists that adjustments of all profiles are unchangeable, they are initially installed in the phone. There is a list of changes in the user’s guide, typical for each profile, probably, it is necessary to learn it or rely on intuition. But most of users need only one function - to switch on the silent mode, they can do it pressing key 6. As you see Philips 330 is a cut version of Philips Fisio 625. The only difference of the new model is that is doesn’t support GPRS and doesn’t have voice memo function. The advantage is 16-tones polyphony, which has average volume, but sounds very pleasant. Philips has one of the best quality of polyphony among European manufacturers. The set of pre-installed melodies is also pretty and it makes the phone very attractive. One can hear to the melodies, pressing a special key in the standby mode. Vibrating alert is a little bit stronger than average. Volume of the loudspeaker and reception quality is high. Operating time is not long, but it is quite sufficient for the phone of this class. 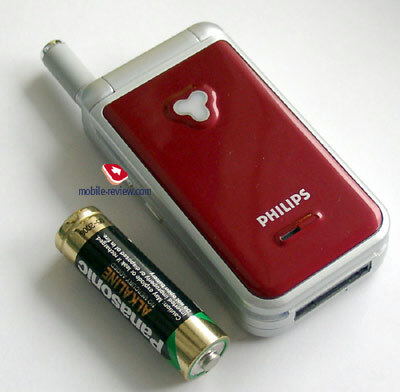 Philips 330 is based on the well-known platform and its shortcomings are already well-known. The list of them wasn’t changed. For example, the phone has a complicated navigation menu, only quick commands can help in this case. All phone numbers (recorded in the international format and not contained in the phonebook) are only half-displayed. To see the full phone number, one should highlight it, the line with the phone number will be automatically scrolled and you can see it. The second way is to select a phone number and press right key. All details of the call will be seen, including a full phone number. When the battery is removed or it is discharged, date and time of the last time are saved. When you switch on the phone, it offers to copy a phonebook from SIM-card to the phone memory. If you’ve already made this operation, phone numbers will double, if you repeat it once more time, they will triple and etc. Philips 330 is not a bad choice, if you’ll be satisfied with a cheap clamshell phone, which has a nice exterior (looks as a more expensive model). It’s doubtful that other similar offers will be available on the market till the end of the year. The phone is not rich in functions, but it has a well-realized polyphony. However, it’s a low-end phone and we can’t demand more from it, don’t forget that it is a stylish clamshell handset. P.S. The sample, which we tested, had several bugs in software. We hope that they will be corrected in a commercial version of the phone.